This summer L’Occitane released Eaux de Provence: three fragrances inspired by “the beautiful fountains that can be found across the villages of southern France, bringing life and refreshment to all.” Sounds lovely…quaint, doesn’t it? Not to me. When Robin here at Now Smell This asked me to review the Eaux de Provence fragrances, I got the stress-induced stomach ache I always get before visiting a L’Occitane store. I’d just as soon show up at an inner city boxing ring and ask the toughest looking boxer with a freshly blackened eye if he’d mind taking off his briefs so I could try them on as go into L’Occitane and ask for samples. L’Occitane sales people are tough and aggressive (at least at the two stores I visit). They are determined you will buy something if you invade their “turf.” If you ask for a free sample, they look at you as if you’re asking for the clothes off their backs…they are NOT amused. I’ve yet to get a freebie from L’Occitane unless I buy something. Thankfully, on this visit, I needed some honey-scented soap. Eau Ravissante (for women) highlights the essential oils of bergamot and Damascena rose; the fragrance begins with “watery” rose mingling with natural citrus aromas (a wonderful fruit peel note). As the fragrance dries on skin, the rose becomes a tad “sour” and powdery (like a tart rose candy). In the extreme dry-down, I detect one of L’Occitane’s favorite notes: green tea. This Cologne Fraîche does have a feminine character and was my least favorite of the three perfumes; I like my rose scents to be either bright and vibrant or deep, sultry and boozy. Talcy, bitter rose doesn’t thrill me. 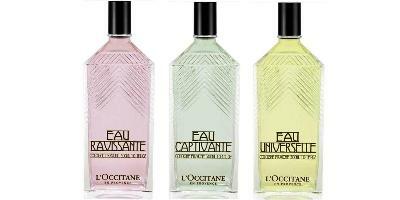 Eau Captivante is a unisex men's fragrance with notes of lime, herbs and bergamot. The fragrance starts off with warm, “green” citrus mixing with aromatic herbs: mint, basil and perhaps some lavender leaf. The fragrance may start off pungent but it smoothes down considerably as it dries on skin. At the end of Eau Captivante’s development, I smell a mildly vanillic mint note (reminding me of old-fashioned melt-in-your-mouth mint candies). This is my favorite of the Eaux de Provence, and wouldn’t you know it, the most ephemeral of the bunch. Do the Eaux de Provence deliver on their “refreshment” promise? The fragrances are water-based and go on “wet” and flat (if you know what I mean…there’s no alcoholic “coolness” or tingling from evaporation on skin). Eau Ravissante and Eau Universelle last for about two hours on my skin but have little diffusion; if you want to enjoy Eau Captivante for more than 30 minutes, you’re out of luck unless you keep reapplying it. Eaux de Provence are perfect for times you want only a hint of scent…scent that will not linger. To make these fragrances more refreshing, store them in the refrigerator. As I left the L’Occitane store, soaps and samples bagged, I heard one last shout-out from the sales woman: “Have you tried our new verbena fragrance? Would you like to smell it?” “Too late, my dear!” I thought. I needed to exit that stressful environment, and, as a reward for getting those samples, I went straight to a café where I had a bowl of doughnut ice cream. THAT was refreshing. The L'Occitane Eaux de Provence are $27 each for 50 ml, or $47 each for 300 ml. Matching shower gels are also available. Oh Kevin, your review was really informative but the description of that store atmosphere made me cringe. One of the things in life I dislike most is high pressure salespeople. I don’t like being fussed over and prefer to take my time, find what interests me or ask for help if I need it. I might need some ice cream after envisioning that environment! Thankfully none of these fragrances sound like something I’d wear (light, poor staying power and subtle aren’t traits I prefer) so I won’t have to brave the waters feeling like chum in a shark tank. Must chime in to say that the staff in my local store are not anything like that aggressive. That said, they used to be nice with samples MANY years ago, but no more. They will tell you flat out that they are “reserved for customers”, by which of course they mean paying customers, but often if you ask more questions, you find they only have them for a few fragrances anyway. Oh, gosh, never had that happen to me! I guess they’re too big now to care about that kind of customer service. Ab scent: I usually have ALL dealings with L’Occitane online! As do I. Often it is a blind buy, and while it might not be a product I absolutely love, I’ve yet to find anything from L’Occitane I passionately dislike, either. Eau d’Iparie and Delice des Fleurs were wonderful surprises, as was their Honey Lemon. Eau d’Iparie was love from the first sniff for me, and it’s the only L’Occitane’s fragrance I really like. I bought it on the spot. And Kevin, thank you for this hilarious post! Lenika: I never got to try that one…and, you’re welcome! The store nearest me is run by a team of people who are aggressive, intrusive, and pushy to the point of rudeness. This is NOT to say that they are bad people– I feel absolutely certain that they are normal, friendly folks. But L’Occitane has trained them to follow a particular customer service model, and they must do as the corporate office bids. Having worked in mall retail for years, I know how it goes, and I try not to lose my patience with the L’Occitane staff. But the incessant shadowing, suggest-selling, and interruptions do take a toll on a perfumista’s patience. Olenska: they sure do! I know they are doing as they are told…but it’s hard not to get tense and terse, isn’t it? Isn’t there a mistake Kevin? I’m 100% sure that when I visited my local L’Occitane and checked out their Polish website, Eau Universelle is sold as a unisex fragrance while Eau Captivante is supposed to be a male one, not the opposite. Butting in again — you are right, and I’ve fixed the error. Thanks! Astonishing that neither Kevin nor I noticed — it is called Universelle, after all! Lucasai: common sense is not my strong point. HA! lol! I’m used to reading a fun sport site and they do that on purpose quite often as a way of making a joke or point. I thought that’s what Kevin was saying – that after testing he didn’t agree with their classifications. Great review as ever, Kevin. I’ve tried these in store and also found them to have poor longevity and although they are pleasant enough, I would rather spend my dosh on a glass of excellent dry vodka martini (or two) with a plate of smoked salmon (perhaps you can tell, I haven’t had my din-din yet). As for SA begrudging our request for samples, I had a very pleasant email exchange with Jo Loves today. When I politely enquired as to why they do not offer samples (paid) on their website, a very generous staff replied with an offer to send me free ones in the post! My local L’occitane shop has very friendly staff but it is so tiny that you feel under pressure anyway. I’ve yet to be in there with another soul other than those who are with me-it is a wonder they are still open! I sniffed these and all I got was a ‘feminine freshness’ products smell. Eau de Femfresh. (or the more excellently named ‘I Love My Muff’ range. Dead serious. Google it. ) layered with Green Tea. Bah. Bring back the Honey fragrance! I’m kind of interested in the doughnut icecream. What store sells that? I remember when l’Occitane first started in France, twenty odd years ago. At that time they mostly sold soaps, body lotions and some face creams. Somehow that image is stuck in my mind and I always forget to smell their fragrances. Their skin care is still good, though a lot more upmarket these days. Your review was hilarious; I have fortunately never had that experience with them. Austenfan…maybe a tough gang runs my stores?! Probably the Piranha brothers in drag! L’Occitane goes back a lot longer than 20 years: it was founded in 1976. But you’re right about the kind of stuff they used to sell. Just like Yves Rocher – mostly toiletries. My nearest L’Occitane store is the size of a large wardrobe: it’s in Westfield (Shepherd’s Bush), and the SAs are very very nice. They’re always pressing some tea on their potential customers. I’ve managed to get a few samples without ever buying anything. I think they live in hope… LOL! I sometimes think the small size of those shops must drive the SAs crazy…thus the “moods” I get in “my” L’Occitane stores. It IS like being in a wardrobe for them all day. I spent a year in France in the late eighties and a friend of mine told me then that l’Occitane had just started. I was obviously misinformed. Maybe they had just had their first Occitane in the area. As I said before I like their creams, their fragrances not so much. I’ve always gotten good service in L’Occitane and often left with multiple samples (though I usually am buying something, as addicted to their hand cream and milk soap as I am). I sampled these eaux a few weeks ago and was completely unimpressed. The verbena, on the other hand, is quite nice and a good antidote to our stifling summer heat. L’Occitane often has scents I’m interested in sampling and there have been a few I’ve loved (the honey lemon one, the labdanum). But the one that got away was their Bergamot Tea. On a trip back home a few years ago, I stopped in at the Pacific Place store to buy the Bergamot Tea. The SA was so unrelentingly hard-sell that I walked out without it! Top Pot has ice cream? And locations conveniently near my relatives’ homes? Clearly I need to make another trip back home. Aparatchick: it made its debut in July…there are Top Pot shops all over now…there’s one downtown that I go to. Golly, I didn’t realize that L’Occitane ever had samples! I’ve *nearly* purchased Eau des Beux several times; maybe with a sample, I’d finally be pushed over the edge to buy a bottle. What they’ve done instead is spray a ribbon to tie around my wrist. I don’t get this, since it prevents me from finding out how the scent smells on *me*! But, happily, I don’t think I’ve had quite the pushy sales experience you describe, Kevin. They’re certainly attentive, though! MR: I hate that ribbon…on my last visit they were using a funnel sprayed with scent to let one try the perfumes. Perfume on SKIN? Unheard of! A funnel? That’s even more odd than a ribbon! What’s the deal? Am I supposed to feel fancy carrying around my scented funnel? Should I put my pinky up while I raise it to my nose for a demure sniff? MR: the funnel just sits next to the tester bottle…you can’t even take it with you. Thankfully they don’t try to put ribbons on manly wrists! HA! Kevin, I love your new avatar! I recently bought someone a gift set at L’Occitane and received a GWP with travel sizes of Eau Ravissante and Eau Universelle shower gels. They really do please me as shower scents! Very refreshing on a hot morning/evening. I’ve received plenty of skincare and haircare samples when I’ve made purchases at my “usual” L’Occitane, but have never even seen a fragrance sample. Odd. I wonder if they’ll let you fill a tiny sample size atomizer? Just today I visited a L’Occitane at a major Australian airport, thinking I might buy the green tea shower gel. I had stayed the night before with some people who had some in their guest bathroom, and it is lovely. The SA insisted I try the green tea perfume, the original and a jasmine scented limited edition of green tea. I have never met a L’O perfume that has NOT turned thin and sour on me, so while I made polite noises about them, I asked for the shower gel. She suggested I buy the body lotion, which is more long-lasting, she said (and expensive, I added in my own mind). She promised a sample of the jasmine green tea but what she have me was a ribbon sprayed with the perfume, which she insisted on tying around my wrist. I went in there willing to open my wallet for the shower gel. I went away empty handed. No sale. This is nearly the same modus operandi as I have encountered (add overly loud speaking tones as the SA announces my choices/interests to the entire store– I felt like a grade schooler being called out by Teacher in front of the class!). And I too walk away without having purchased what I came for… or anything at all. I wonder if this is why L’Occitane feels compelled to release new product (and discontinue existing product) every ten seconds. They think stuff isn’t selling… but we want to buy, if only the SA’s didn’t turn us off at point of purchase. And yet they stay in business. Someone must be buying! AM: around the world the annoying behavior remains the same! All the L’Occitane fragrances smell similar to me. I guess they use the same base? I thought these were very bland. There are many better L’eau’s out there..
Oh Kevin – you had me spewing my tea at the boxer’s briefs point! Fun review (but mostly I laughed at how skeered you were). Amen, brother. I innocently strolled into a NYC L’Occitane to buy a Savon L’Occitan Pour Homme. ($7.00 – delicious) and my 6’2″ Amazonian SP (female) kept leading me to the shea butter soaps. I explained, again, that I want the L’Occitan Pour Homme. Then someone gave me a 15% off of a zillion $ and pushed a $168 gift set. Extremely annoying. All the while, I expected the paid holiday harpist to leap off her stool and put and Immortale cream on the counter for me. Jeez, just let me buy what I want.